These parameters control the execution of buy orders when using tssl as buying strategy. BUY_LEVEL 0.1 Values: numerical – represent a percentage. This setting can be used as protection against buying above EMA. The default value of 0.1% will prevent the bot from buying when the price is not at least 0.1 % under the lowest EMA. BUY_RANGE 0.6 Values: numerical – represent a percentage. This sets the buy range for pure tssl. Setting a range of 0.5% at a current price of 0.1 would set a range between 0.0995 and 0.1005. GAIN 1.2 Values: numerical – represents a percentage. Defines the percentage of gain above bought price to start trailing. Always set this higher than your SELL_RANGE to cover fees and avoid selling at loss. SELL_RANGE 0.6 Values: numerical – represent a percentage. This sets the sell range for pure tssl. Setting a range of 0.5% at a bought price of 0.1 would set a range between 0.0995 and 0.1005. TSSL_TARGET_ONLY true Values: true or false. 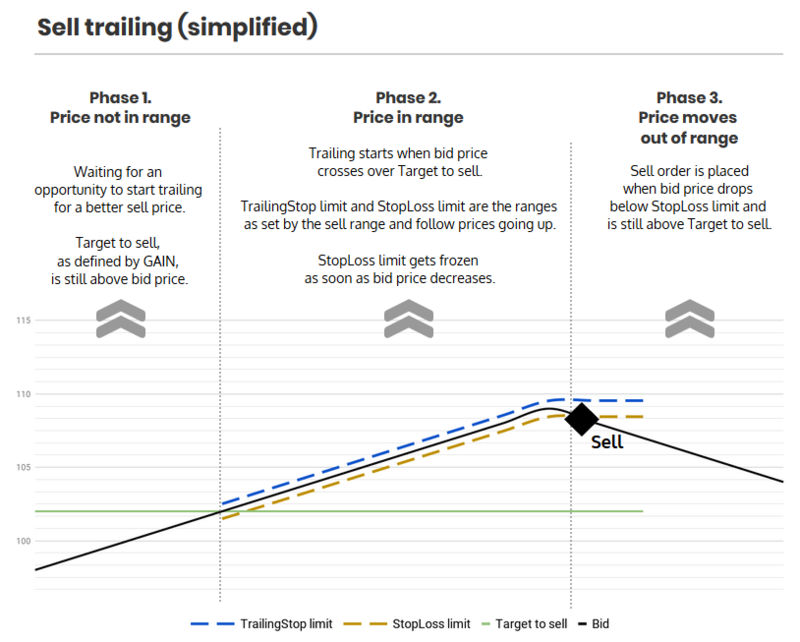 Setting this to true protects you from sell orders below gain when using tssl as strategy, making the value you’ve set for GAIN the starting point for trailing. When set to false, hitting the lower boundary of the range set directly after buying leads to a sell at loss. General settings for tssl including the relevant indicators for this strategy. MIN_VOLUME_TO_BUY 0.001 Values: numerical – represents the total value of a coins holdings in base currency. Sets a threshold for buy orders. If you own less than the set amount, buy orders will still be placed. This prevents owning very small quantities (dust) blocking buy orders. DU_METHOD HIGHBB Values: HIGHBB or RSI. This sets the trigger for placing buy orders with Double Up. When set to HIGHBB Gunbot will start averaging down a bag when the upper Bollinger Band drops below bought price (as in, the distance from it set with HIGH_BB), and will then buy again when the upper Bollinger Band drops below the average buy price and the price is below last buy price, as set in DU_BUYDOWN. When set to RSI buy orders will only be placed when the set RSI_BUY_LEVEL is reached and the price is below last buy price, as set in DU_BUYDOWN. These settings have no function in tssl and act as placeholders.